Many of the o-ring style comic packs had head issues. 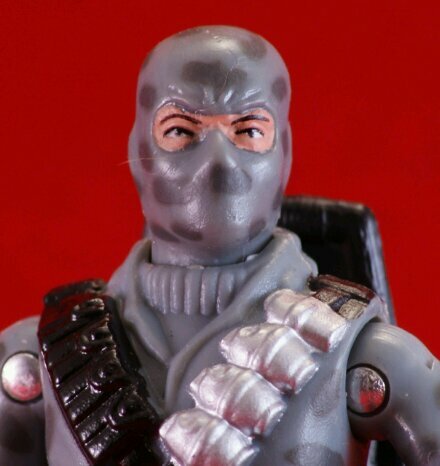 The Joes in particular seemed to get the short end of the cranium stick. I’ve wondered if the smaller heads were a design choice, or the result of a manufacturing issue. After all, the newly designed figures of the era had more delicate sculpting and generally smaller heads. 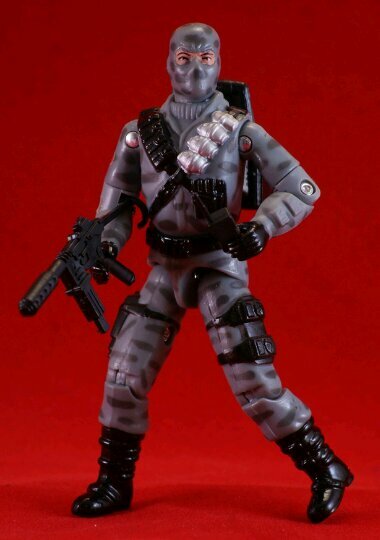 I hate to fixate on the head, but that’s the element of this version of Firefly that stands out the most. The head is well detailed, and shaped differently from the original. There’s nothing wrong with the 1984 head, but it is a product of its time, and not as detailed as this one. The new one incorporates more detail, like a furrowed brow, and a more realistic shape. But there’s more than a new noggin happening here. The paint job is a new take on the existing figure, and one that benefits from improvement in paint processes since the 1980s. Firefly’s uniform has a crispness and detail to its camo that wasn’t seen thirty years ago. Although the black finish is a bit on the glossy side, Firefly is looking slick in his new duds. Having all the classic Firefly accessories molded in black is a nice bonus as well. Is it too much to say that I think the turtleneck could use some color to help it stand out a bit? This Firefly was one of the standouts among all the Fireflys we got during the SpyTroops era. That new head is just great and honestly was the reason I was okay with getting that comic pack. I really wanted the Serpentor and couldn’t get enough of Scrap Iron at the time, but a new head on the classic Firefly body in classic Firefly colors was enough to pull it into a must buy even if the colors on Scrap Iron were a little too bright for my tastes. Very nice looking Firefly. I know they make too many versions of this guy, but this is one of the best. This was the only comic pack figure I purchased, and I’m glad I did. The new head is fantastic. Nice paint too. Looks great against that red background–nice photos, Rob! Thanks! I have a new lightbox and lighting setup that I’ve been using for the past couple of weeks. Wonder if the other cobra troops mocked him in ’05 for still carying around that old phone? On an unrelated topic. The other day was my countries national holiday so i made a video review of my namesake. How do i upload it? Can someone help? Upload it here? If so, shoot me a message via the contact page. Amazing the difference a slight head-reworking makes. I think this lifts the perfectly good Firefly v1 into something really excellent. Easily my favorite Firefly from the o-ring era. I was never too thrilled with the droopy eyes on the ’84 original. This comic pack version improves on that front and then some. It is everything the ’84 Firefly deserved to be but wasn’t. Hope to see that review soon. I hadn’t though about a head swap since I wasn’t sure the colors matched to a tee. I’ll be looking for extras now so I can give it my own shot.